Since Cryptozoic are (quite sensibly) erring on the side of caution when it comes to inviting new waves of people into the Alpha, it looks like I won’t be getting access to Hex until the end of the week at the very earliest. So, instead of discussing the alpha directly, today I’m going to look at some of the changes made to cards from when they were first revealed to the alpha spoiler released recently. First though, I quickly wanted to remind everyone about the Booster Competition that is still running here. You can find full details here, to summarise though, you have 3 ways of entering – you can Like our Facebook page, follow us on Twitter or comment on this article below! Facebook Likes, Twitter follows and commenting on the site here are 3 separate raffles, so if you do all three you have three chances to win – the competition ends on October 25th, and the 3 winners will all get some free boosters! Now, onto the cards! 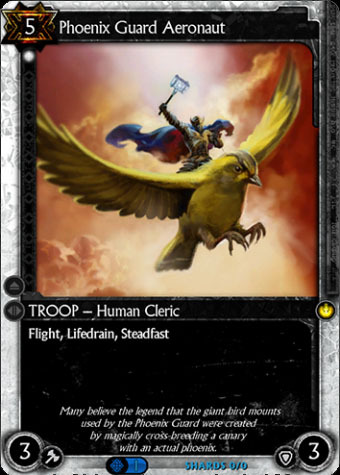 When I initially went through the spoiler document, the changes to the Phoenix Guard Aeronaut were the first to catch my eye. In its original incarnation, the Aeronaut was a 3ATT/4DEF troop with Flight, with a special ability that forced your opponent to chose between either playing cards or attacking – the Phoenix Guard Aeronaut preventing them from doing both in a single turn. Now, as you can see, it has been reduced to a 3ATT/3DEF, and his special ability has been replaced with the Lifedrain and Steadfast keywords. Honestly, I’m not personally too surprised that this card was changed – when I first saw it I thought it was going to be a pretty annoying card to play against, especially in the first set when the card pool is relatively limited. In its original form, it would massively disrupt your entire game and unless you happen to be running a deck with something to quickly remove it, you’d be in pretty big trouble. I’d probably expect the effect to return in a later set on another card, once a greater range of effects and options are available to players. Ash Harpy – This card has been completely redesigned. Though it retains its 5 cost and 2 Ruby Threshold, it has had its stats and abilities changed entirely. Originally, it was a 2ATT/1DEF with a Basic Action ability to sacrifice itself in order to deal 2 Damage to all non-flying troops and each Champion (great for wiping the board of weaker hordes) , and a secondary ability that returned it from the graveyard to your hand if you played 2 other non-resource cards in a turn. Now it’s simply a 0ATT/3DEF with Flight and Rage 4. While it’s tough to call this a nerf – it’s essentially a completely different card that happens to have the same name – the new Ash Harpy certainly isn’t as powerful as it used to be. The reasoning behind this game is tough to guess at – perhaps Heat Wave was added to the set later in the process and the Harpy effect was no longer needed as part of the initial lineup? Argus, Herald of Doom – Despite being the most expensive card in the set, Argus has none the less seen a slight nerf. While originally it had an attack value of 0 and an exhaust ability that would directly deal 5 damage to each enemy Champion, it now simply has an attack value of 5. This means that he can be blocked as normal and, in situations where it’s actually relevant, can only damage 1 Champion at a time. A pretty understandable change, when you consider that if you had Argus in your starting hand, you could play him on turn 6. Rune Ear Commander – Originally a 0ATT/1DEF troop with Rage and a cost of 1, the changes to the Commander essentially make it a new card. With a cost of 4, he now has attack and defence equal to the number of troops you control, meaning he can potentially be an immediate huge threat, especially in Shin’hare decks that revolve around making a lot of troops. He’s essentially become the big hitter than I think the Shin’hare were missing. Sliver of the Immortal Spear – The originally revealed version of this card had a health cost associated with the ability to create more copies of the card, and this health cost would go up each time the ability was activated. Losing that health cost has made the card much more playable – a fact that can be seen in the decks popping up in alpha that use this card as the win condition. Blood Aura – The additional effect on Blood Aura originally gave the target troop the ability to be blocked only by Blood and Artifact troops. The new effect Voids troops that die after being dealt damage by the target – an effect that is less powerful at face value. Still, with buffs to cards becoming permanent, the ability to send cards to the Void rather than the graveyard may become relevant sooner than we might expect. Archmage Wrenlocke – The Archmage has traded in his ability to reduce the cost of all actions by 1 (to a minimum of 1) for a small 1ATT/1DEF boost to his stats. Presumably the reduced cost of all actions allowed some combos that were simply far too powerful, but the change is a little disappointing as many people, myself included, were looking forward to making use of the ability. He still retains some usefulness though, as his cantrip ability is powerful, and the extra defence puts him out of range of common damage-based removal. Extinction – This card was changed from a 5 cost to a 4 cost – a minor change at first glance, but the ability to wipe the board a turn earlier could be the difference between victory and defeat against many aggro decks. Perhaps this change was made to prevent aggro decks from being overwhelmingly powerful early on? Chlorophyllia – Instead of creating 2 new Wild sources and playing them, Chlorophyllia instead now directly gives you 2 Wild threshold and 2 permanent resources. This change has a few effects; you no longer get extra resources to spend that turn, your Champion no longer receives 2 charges, and it no longer creates a very powerful combo with the Wild Root Dancer. All in all, an unsurprising change. Rot Caster – Given that they share the same effect, it is believed this card replaced another called Xarlox the Brood Lord, who had a cost of 4 and 2ATT/4DEF. The effect itself remains powerful, but the increased cost and changed stats are undoubtedly a nerf to the original card. Prophet of Lodegan – This card has been simplified slightly, and gained a small boost in the process. Originally this card created other Prophet of Lodegan cards, and his ability had the caveat that it only triggered if played from your hand. Presumably this change was made just to simplify the card, but it has the added bonus that the Replicator’s Gambit combo I mentioned in my Synergy article will now actually work as advertised! Battle Beetle – The mighty beetle no longer has the Crush keyword, presumably to add a little more distinction between it and the Tyrannosaurus Hex. Genesis Hydra – The Hydra was originally a 2ATT/2DEF troop that doubled in size every time it took damage and survived. This meant that dealing the original damage could be tricky – you needed to be able to deal 1 point of damage to it reliably – but it’s potential was huge. Now boosted to 4ATT/4DEF, it’s a lot easier for it to survive the damage required to trigger its effect, but the effect only gives an extra +1ATT/+1DEF. More reliable, but ultimately less powerful. Honeycap – Shroomkin! This lowly little mushroom’s effect originally only triggered when it attacked, and the buff was temporary. This meant that while it had the potential to be a powerful attacker, it was basically useless as a defender and extremely vulnerable to all forms of removal. Now his effect triggers once when he enters play, which means he is fixed at the point you play him, but ultimately is more reliable. Spirit Dance – Originally this card gave -2 Def to all troops rather than +2, and this seemingly minor change massively alters the entire card. To be honest, I think the original version may have simply had a typo in it, but it bares mentioning as almost everyone had written the card off as worthless, and the text change it so minor that it might be overlooked by a lot of people. Uzume, Grand Concubunny – Uzume originally possessed an additional effect which let you create a free Battle Hopper at the start of the game if she was in your opening hand. The loss of this ability has also seen her cost reduced from 7 to 6. There are a couple of reasons I can see for this change. First, it may have just been considered a pointless ability. More likely though, 7 may have been too high a cost to make her ability useful at all, and to make the cost reduction the Battle Hopper ability was first in line for the chopping block. Wild Growth – Originally this gave troops +4ATT/+4DEF – this has been given a change to +3ATT/+3DEF, but also now reduces its cost to 0 and shuffles back into your deck instead of simply being discarded as normal. This has massively increased the potential of the card, as getting this back out of your deck for free is a massive boost, but the fact that it is now free once re-drawn will always leaving your opponent wondering after that first time you play it. Those are the major changes, but there are also a bunch of more minor ones, which are listed below. Polymorph: Dingler – Now explicitly Reverts the target troop first. Grim Skull Sorcerer – Changed from a 1ATT/3DEF to a 2ATT/1DEF. Verdant Wyldeboar – Cost increased from 1 to 2. Also renamed from Petulant Wyldebeest. Shield Trainer – Lost the Steadfast keyword. Burn To The Ground – Now costs 1+X rather than just X.
Lord Alexander, The Courageous – Lost the Speed keyword. Runts of the Litter – Reduced to 1 cost, but now creates only 2 Battle Hoppers instead of 3. So, there you go. I’m pretty sure I’ve got most of the cards that have changed in the alpha spoiler from when we saw them previously, but it’s possible I’ve missed something – if there are some changes I’ve not included, let me know in the comments below! That’s all for today! Check back next time, when I reveal which major city is soon to be swallowed by Cthulhu! This entry was posted in Alpha, Cards and tagged alpha, changes, competition by Icepick. Bookmark the permalink. Great article. Hope you continue doing these as the alpha develops. While some of the changes are disappointing a lot of them are good changes. Some cool combos are gone but some new ones are there now. Can’t wait to get my hands on the game. The fact that they’ve simplified a few cards like Phoenix Guard and Ash Harpy shows that they’re trying to make the first set at least a bit new player friendly. I think we can definitely expect to see cards with the previous effects of the 2 that I mentioned in future sets. Very interesting article. I thought I noticed some changes but I didn’t pick up on all of them. Most of these were simple balancing issues but I wonder if some were done due to actual programming issues. Time will tell I guess. That said I have full faith in the Cryptozoic crew and cannot wait for my Alpha access invite to arrive. The simplification of some cards are a little disappointing, but it was probably required for balance. I think they don’t want many unorthodox cards in the first set. aaaaaaaaand it changed : At the start of your turn, reveal three random cards from each opposing champion’s deck. Each troop revealed this way gets permanent -1[ATK]/-1[DEF]. If a troop’s [DEF] is reduced to 0 or less this way, revert it, then transform it into a Zombie and put it into play under your control.